The following series of undated “lessons” appeared in the Boy’s Own Magazine, the first and most influential boys’ magazine, in Great Britain during early 1861. Spread out in separate installments across four issues, these unique articles contain illustrated instruction in the use of the broadsword and single-stick (the blunt training tool for the broadsword). 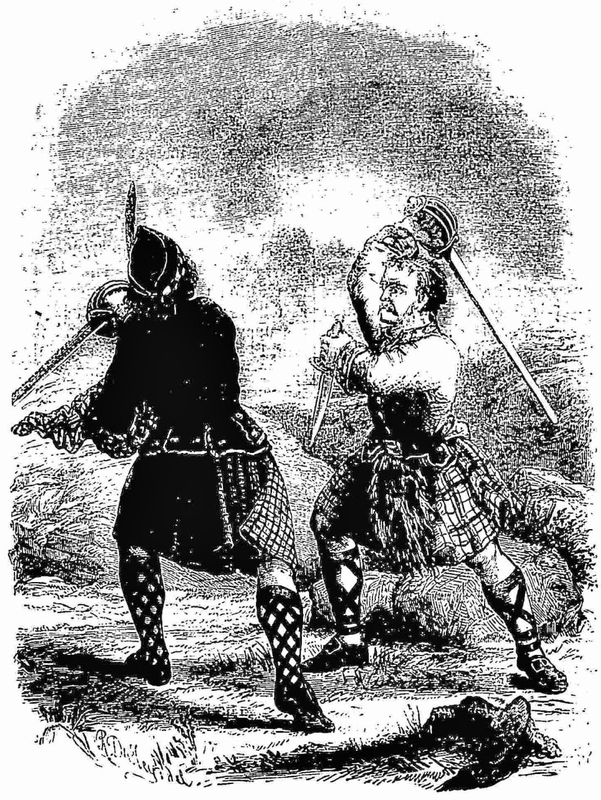 Billed as an introductory “course” for British youth, they include rules for “single-stick play,” a discussion of fencing theory, special calisthenic exercises intended to condition the broadsword fencer, directions for practice, target drill, lessons in attack and defense, and a special concluding section detailing the use of the broadsword against the bayonet. To our knowledge, this series has not seen the light of day since it was first published during the late nineteenth century. Following is Part I of the four-part series, originally published in Issue No. 1, Vol. VII, January 1861, of the Boy’s Own Magazine. The remaining chapters will follow in weekly posts on MartialArtsNewYork. The whole of the exercises we intend to give in this course are based upon the system long employed in the British army for making cavalry soldiers and infantry officers masters of the sword. Even in the army, single-sticks are always substituted for the sword, as, in fencing, foils are used instead of the sharp-pointed rapier. In learning the art of fence, our object is not to acquire a dexterity which shall enable us to run an adversary through the body before he can accomplish as much for ourselves, but rather to strengthen our frames, and improve our deportment by means of a noble and healthful exercise. Rapiers are no longer worn by gentlemen; duelling has died the death of all false and absurd practices; and the fashion of settling a quarrel hilt to hilt has become a thing of the past. 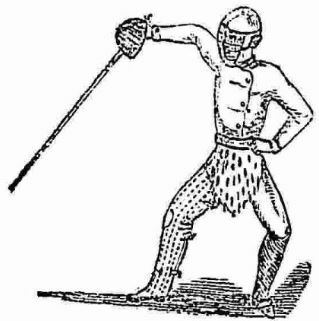 But as, because we may never have occasion to parry a thrust from a rapier, is no argument against learning to fence, so the fact of our never making use of a broadsword except in war, is not allowed to interfere with our desire to acquire dexterity in wielding such a weapon. There are very few boys of a spirited nature who do not long to be able to execute the broadsword exercise. The common habit of flourishing a stick about is only a vague and loose expression of this natural inclination. In all these exercises our personal safety demands that, although we are studying the modes of using a broadsword, we shall always employ a single-stick. In fencing, we practise with a foil, the point of which is covered with a knob of leather; in the broadsword exercise, we execute the cuts or guards with a piece of wood, which can do us no greater injury than an occasional rap upon the knuckles or leg, and only then if we are more than ordinarily clumsy. Let us remember, then, that when we use the term stick or sword, we, for those reasons, always mean the single-stick. One thing must, however, be understood, and this is, that the stick must always be used as if it were a real sword, with a true cutting edge. In delivering a cut, this edge must always be turned towards the object cut at. As we shall often have occasion to speak of the “edge” of the weapon, we wish it to be understood that we refer to an imaginary line running down the stick from hilt to point. It will be as well, at first, to draw a line of red paint down the stick along that side opposite to the open part of the hilt. If our students will give a glance at the relative positions of the edge of a sword and its hilt, they will at once see what we mean. Single-sticks may be purchased at any fencing-foil vendor’s, at the rate of about eighteen-pence per pair. This first outlay includes the pair of basket hilts, which will last as long as you may have occasion to use them. The sticks themselves are apt to get broken after a time, but, as you can purchase others, made to fit into the basket handles, for two-and-sixpence per dozen, you may consider your weapon a sufficiently cheap one. The sticks are about forty inches long, are made both of ash and hazel, and should not be so weak as to bend. Ash sticks are the best, for, being whiter in colour than the hazel, they are more quickly seen by the eye in the exercise. Forty inches will be found too long a stick for a boy of short stature, in which case it may be cut down some inches. This will necessitate the abridgment of the opponent’s stick, as both weapons should always be of an equal length. Masks must be worn on every occasion—on no pretext whatever is single-stick play to be engaged in without their use. It is a pity that these indispensable adjuncts to our exercises happen to be rather expensive. They are usually sold at about eighteen shillings the pair. They are absolutely necessary, but they are dear. What are we to do if we cannot afford to purchase them? Why, make them for ourselves. The best plan is to get them from a maker, if we can spare the money; if we cannot do so, the next best thing is, when we pay a visit to the manufacturer to purchase our single-sticks, to examine the construction of these masks very carefully, and go home, and make, perhaps, a clumsier article, but still a perfectly efficient one for our purpose. In the present case, both necessity and economy combine to give a spur to invention. We leave the rest to our students’ ingenuity. BEST MODE OF PERFORMING THE EXERCISES. The system should be one of mutual instruction. Select a school-fellow or companion about the same stature as yourself, and each of you, with a copy of our BOY’S OWN MAGAZINE in your hands, act alternately as instructor. At first every student may practise our lessons singly; but, towards the close of the course, when the various modes of attack and defence come to be described, the exercises must be performed by two boys—one to attack, the other to defend. It will be remembered that we have already laid down precise rules for this part of our studies, both in the preliminary instruction for the performance of the young rifleman’s drill, and also for the art of fence. It will be as well to turn once more to our remarks made at page 313, Vol. V., and to page 214, Vol. VI. We have only to add, that strict attention must be paid, to every direction we have given, as they are carefully written, and must not be varied or departed from. The jacket or coat should be thrown off before commencing this exercise, so as to afford free play to the upper portion of the body. The broadsword exercise consists of seven cuts or directions of the edge, and of the same number of defensive positions. We shall speak further of this part of the subject in our next lesson. Engaging is the act of joining swords with an opponent previous to an attack. In Engaging, there should only be a slight pressure exerted upon the stick, in order that both your hand and wrist may be thus rendered capable of performing any motion required by circumstances. The Inside and Outside Guards are merely the terms used to denominate the modes of engaging your adversary’s weapon, and are merely preparatory to any offensive or defensive movements that may be made. Each cut is numbered, as is also its corresponding guard; and, whenever we have occasion to order any cut or guard to be made, we shall designate each by number. All the seven cuts and guards are to be carefully learned and practised until the student can deliver them without the least hesitation. The directions of the sword in both cases will be explained when we speak of the broadsword target. A Feint is a half-cut menacing a certain part, whilst the intention is to direct it at another; and the true cut should be given immediately upon the opponent answering to the Feint. A Lunge is the art of extending yourself to the full distance of your stride, in order to approach your opponent’s body in delivering your cut. Recovering is the act of resuming the position of guard, after you have lunged at your opponent. Nothing is more conducive to your safety than a quick and easy recovery to guard. Prove distance will be hereafter explained. Extension motions, balance motions and positions, the target, &c., require no independent explanations, as all will be fully treated of in detail in the succeeding lessons. 1. No cut to be given too violently, or in such a manner as to cause anger or irritation. 2. All disparaging criticisms of an opponent’s play are to be studiously avoided. 3. Every cut to be acknowledged on the student’s receiving it, by his passing his stick into the left hand; the opponent, at the same moment, coming to an Engaging Guard. 4. Upon the renewal of the contest, both players are to take up a position out of distance, and to come within it cautiously, in order that neither may be taken by surprise. 5. No two cuts to be made upon one lunge. 6. Should both opponents make the same cut at the same time, that player’s cut which has been given in the third position to be considered effective. 7. No cuts to be made at the head. 9. As every cut is made from a defensive position, care must be taken to immediately return to such as soon as the cut is delivered. 10. The stick being the substitute for the sword, no cut can be deemed fair and effective which has not been given with that part corresponding with the edge. 11. No movement, either of attack or defence, to be attempted with the single-stick which could not be performed, or would not be hazarded, with the sword. 12. On no pretext whatever is practice to take place without masks. Your muscles will be flaccid, weak, and worthless. Click here to continue on to PART II of this series. More vintage articles on self-defense can be accessed on our Resources page. « Manly Exercises. The Broadsword and Single-Stick. Part II.